Late sixteenth century, French. Featuring an intricate, pierced design (over 120 seperate piercings), and plated in 23K Gold. The original jewel was gold, set with table cut diamonds. This replica uses cubic zirconia as the finest diamond simulant. From the jewel hangs a good quality synthetic drop pearl. 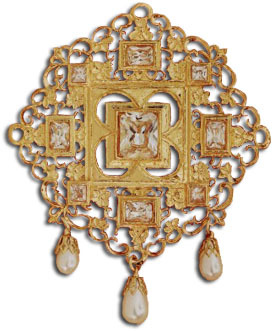 The original jewel was owned by the Duke of Lorraine, though in 1592 he gave it to the Duchess of Elbeuf as part of the payment on her husbands ransom. Width 8cm. 23K Gold-Plated Pewter. Made in the United Kingdom.